For a number of years I've studied the use of organic fertilizers for growing commercial greenhouse crops. To start I chose to evaluate fertilizers that could be mixed and applied using methods familiar to growers using traditional water-soluble or granular slow-release chemical fertilizers. Right now I recommend Nature's Source 3-1-1 liquid fertilizer and Sustane 8-4-4 granular slow-release fertilizer. Both of these are readily available, cost effective, OMRI-certified, and have good label directions for greenhouses. I've also evaluated or am currently trialing other organic fertilizers and these are listed with comments in the table accompanying this article. Two liquid fertilizers which may have promise one day are Bombardier 8-0-0 and Espartan 2.0-3.03-2.6 manufactured by Kimitec in Spain. At this time these have limited availability, are rather expensive, and the labels are not written for greenhouses. Nature's Source, Bombardier, and Espartan are plant extract fertilizers and Sustane is made from poultry wastes. My work has led me to recommend using different organic fertilizers in combination rather than relying on one fertilizer. I suggest using Nature's Source and Sustane together to take advantages of each fertilizer's strengths. This would be done by incorporating Sustane in the growing medium at planting and then fertilizing on a regular basis with Nature's Source starting about 4 weeks after planting. Combinations should be considered regardless of what brands or types of organic fertilizer are being used. Here are some more important specific recommendations on how to use organic fertilizers to grow greenhouse plants. 1. Mixing and application. The fish fertilizers and plant extract fertilizers are sold as concentrates and they must be diluted in water to be safe for plants. Nature's Source, Bombardier, and Espartan have a pleasant "beery" aroma as concentrates, but within 7 days of being mixed with water they "spoil" and develop very unpleasant odors. The odor, however, is not as bad as fish fertilizer. The nutrient value of spoiled fertilizer is unknown and the colonies of bacteria which develop may plug irrigation lines, so diluted fertilizer solution should be used as soon as possible after mixing. Fish fertilizer has the thickest and least consistent solution and should be agitated before mixing with water. Bombardier and Espartan concentrates are "syrupy" but mix well with water. Nature's Source is the thinnest concentrate and it mixes well with water and can pass fertilizer injectors. Sustane is a granular fertilizer which would be mixed with the growing medium before planting. It is the easiest organic nutrient source to use in combination with the liquid types. 2. Fertilizer analysis. Some organic fertilizers supply only one or two of the NPK elements; an example is Bombardier which is 8-0-0. So a grower using Bombardier would have to use other fertilizer(s) to supply P and K. I recommend Sustane which has an 8-4-4 analysis or some other complete NPK granular organic fertilizer. 3. Nutrient disorders. Plants may develop an overall light green or yellowed color caused by a general nutrient deficiency or, more likely, just N deficiency. For example, if Sustane is used alone the symptoms might occur about 45 days after planting, the end of its release time. This can be prevented by applying an organic liquid fertilizer supplement about 30 days after planting. Interveinal chlorosis sometimes occurs about halfway through cropping time if plants are fertilized with some liquid organic fertilizers alone starting at planting. This chlorosis is most likely caused by an accumulation of too much ammonium-nitrogen in the plant, so-called "ammonium toxicity". Most greenhouse crops do best with a combination of ammonium and nitrate nitrogen. Unfortunately organic fertilizers generally don't contain nitrate-nitrogen. The best approach is to rely on Sustane as the sole source of nutrients for the first month after planting and then start applying Nature's Source or another liquid organic fertilizer. 4. Organic fertilizer effects on growth medium soluble salts (EC). 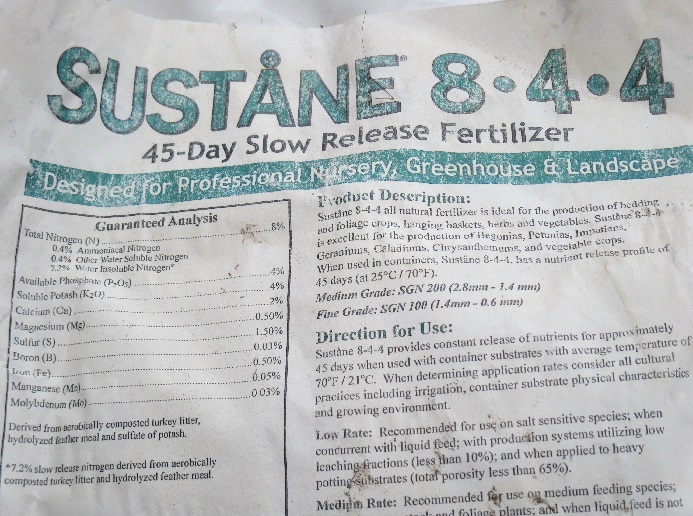 Sustane is a slow-release fertilizer and its use results in low EC, and potentially a deficient level after 45 days. As for the liquid organics, at the same N level the lowest EC results from Nature's Source (similar to chemical fertilizer) and then Bombardier. Espartan results in an EC significantly higher than the other liquid organic fertilizers which might be an aggravating factor in ammonium toxicity. In short, from the standpoint of EC, Nature's Source is the best. 5. Overcome reduced size caused by organic fertilizers. Many growers who have used organic fertilizers have observed size reductions compared to what they are used to with chemical fertilizers. Some growers say "raise the rate (ppm)" of organics to compensate. If you have done this and it works, carry-on! Otherwise give it a try starting with increases of 20% at a time. Increasing the rate in 20% increments is likely to be partially successful, but because of a nutrient imbalance, ammonium toxicity, or some unknown factor results may be disappointing or worse. 6. Plant species-specific responses. It seems that plants may respond differently to organic fertilizers. For example, marigolds and petunia grow as well fertilized with a combination of liquids and Sustane as they do with chemical fertilizer, but seed geraniums do not and are very prone to chlorosis from too much ammonium. At this point in the development of organic fertilizers for commercial greenhouse use, use them with caution on plants you know have exacting nutrient requirements or those prone to foliar chlorosis. Fertilizers should always be tried first on a small number of plants. 7. Best uses. The fertilizers discussed in this fact sheet are probably best for short-term crops of less than 6 weeks duration when environmental conditions are most favorable for plant growth (e.g., April-September). Bedding plants, herbs, and vegetable transplants are good candidates for trying organics. Assuming the plants are of good quality and color, reduce or stop using the fertilizer within a week or two of planned marketing. This practice will reduce the chance of ammonium toxicity symptoms. Neptune's Harvest Organic Fish fertilizer Liquid emulsion 3-1-5 Fish fertilizer has been widely used organic fertilizer for many years. The emulsion needs to be well mixed to give a consistent material for dilution and application. Once mixed with water it spoils and develops a bad odor. Mix fresh and use immediately. Leaf chlorosis, probably due to ammonium toxicity, is common. OMRI listed. Plant Natural alfalfa pellets 5-1-2 Alfalfa is a legume and therefore is rich in nitrogen. The pellets are often used as animal feed and are similar in size and shape to wood pellets used in pellet stoves. Ppellets supported the plants for about 40 days and then are exhausted of nutrients. Also, they swell when water is added greatly increasing the volume of medium in a pot. Limited potential for this fertilizer. Kimitec Bombardier Liquid 8-0-0 Bombardier is a plant extract fertilizer made from fermented sugar beet molasses. It works well with Sustane which supplies the absent P and K. Some plants develop interveinal chlorosis due to ammonium toxicity. Chlorosis is lessened or eliminated by combining with Sustane. Dilute solutions spoil within 10 days. Quite expensive and limited availability. USDA/NOP approved. Kimitec Espartan Liquid 2.0-3.03-2.6 Espartan is a plant extract fertilizer made from fermented sugar beet molasses. Some plants develop interveinal chlorosis due to ammonium toxicity and growth medium EC is rather high. Chlorosis and EC are lessened or eliminated by combining with Sustane. Dilute solutions spoil within 10 days.Quite expensive and limited availability. USDA/NOP approved. Sustane Granular 8-4-4 Granular slow-release fertilizer made from turkey litter, feather meal, and potassium sulfate. Release time is 45 days, but nutrients may run out a little sooner. Excellent fertilizer to combine with liquid organics especially those with no phosphorus or potassium. OMRI listed. 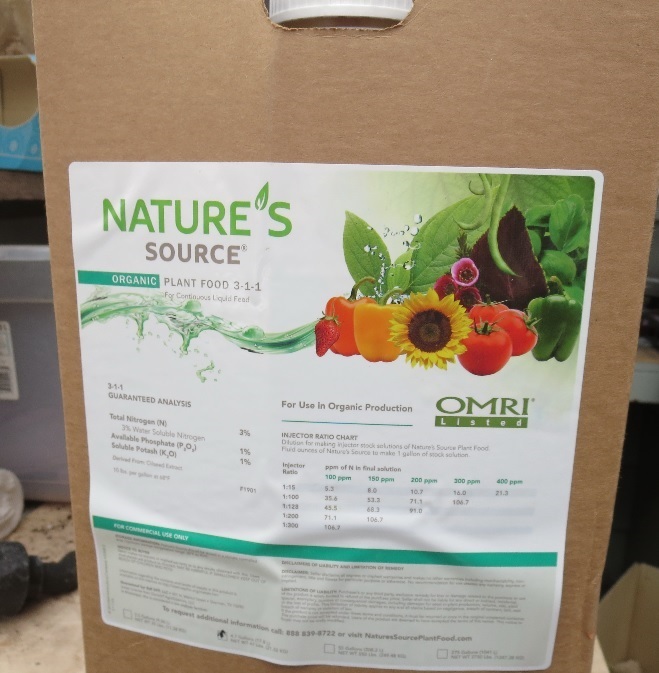 Nature's Source Liquid 3-1-1 Despite the low nutrient analysis Nature's Source is currently the best liquid organic fertilizer. It is made from oilseed extract. Container has dilution rates expressed in familiar terms for greenhouse growers. I have seen no foliar chlorosis yet with this fertilizer. Nature's Source is widely available and a great improvement over its predecessor Pinnacle. OMRI listed. Verdante EcoVita Granular 7-5-10 I am currently testing this granular slow-release fertilizer. It has a release rate of 100 days. The granules are composed of bone meal, soybean meal, cocoa shell meal, feather meal, and fermented sugar cane and sugar beet molasses. I see potential for this one and it's available from Griffin Greenhouse Supply. OMRI listed. Verdanta PL-2 Liquid 2-0-6 I am currently testing this fertilizer made from fermented sugar cane and sugar beet molasses. It should be agood supplement to use in combination with other organic fertilizers low in N or K. Available from Griffin Greenhouse Supply. OMRI listed. Ferti-Nitro Plus Powder 13.6-0-0 I am currently testing this fertilizer as a supplement to use in combination with other organic fertilizers low in N. It is made from hydrolyzed soybean protein and is soluble. OMRI listed.